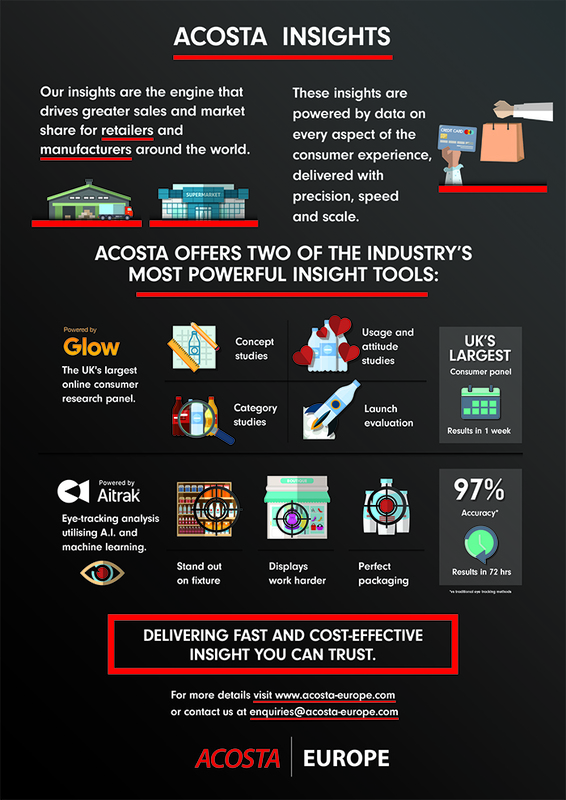 Acosta Europe, the retail sales and marketing group, has announced the launch of two powerful new retail strategy products, Glow and AiTrak, which will provide customers with insights into consumer behaviours. Glow is a consumer survey tool and digital monitoring system that helps marketers navigate the challenging gap between planning and feedback cycles. Glow gives brand and channel marketers the ability to generate detailed product, campaign or concept feedback within one week; much quicker than the traditional feedback cycle. It does this through access to the UK’s largest online consumer research panel, delivering results quickly and in user-friendly infographics that will provide robust insights for brand planning, and ensure the right marketing investments are made in the right channel.